Being a student of history means constantly discovering amazing new things about our world, our culture, and ourselves. There are so many unexpected twists and turns, synchronicities, coincidences, and flat-out mind-blowing facts waiting to be uncovered. And when you’re a student of history with an interest in puzzles and games, it means you get to discover just how long humans have been dabbling in baffling brain teasers and friendly competition. Board games, for instance, have been around a long time, longer than most people realize. There is evidence that Go has been played in China for more than 5,500 years! And many other games also have shockingly long lineages. 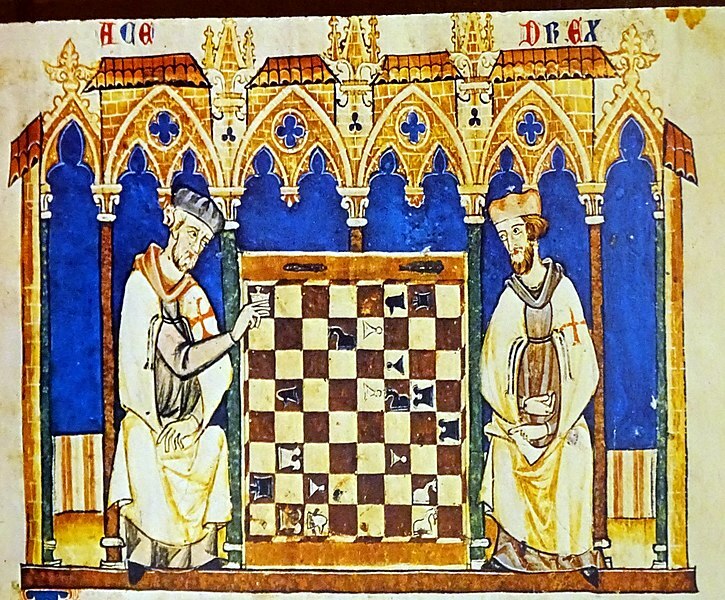 Chess can be traced back to the seventh century in India. Game boards have been found in king’s courts, university halls, and even former houses used by the Knights Templar, as pictured above. We’ve previously explored that Viking gravesites from the ninth century reveal that board games were not just a pastime for the Vikings, but that their win-loss records were important enough to be recorded for posterity! Check this out. It’s an ancient Greek painting on a vase, dating back to 530 BCE. This piece is an example of the black figure technique where images painted on clay turned black when the clay was fired. 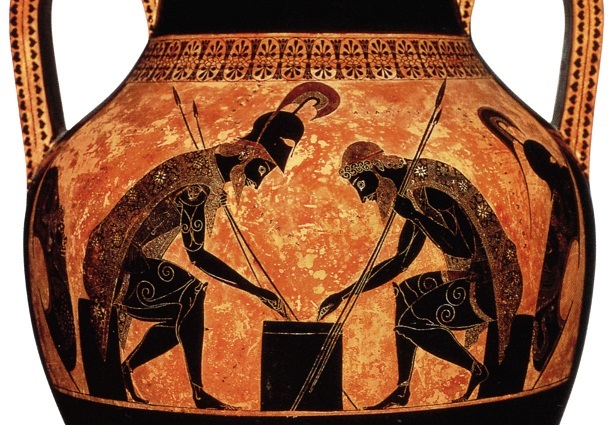 It depicts the two mightiest warriors of the Trojan War, Achilles and Ajax, playing a board game to keep themselves busy during the siege of Troy. 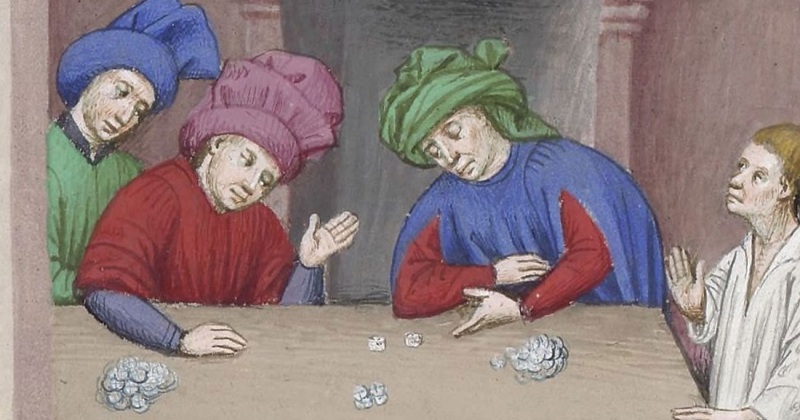 It’s unclear what game they’re playing, though many historians believe the warriors are rolling dice in the image. That would make sense, since astragali (the knuckle-bones of goats and sheep) were used in ancient Greek gambling games. Dice have an equally ancient history. The Egyptian game of Senet, which was played with dice, dates back over 5,000 years. 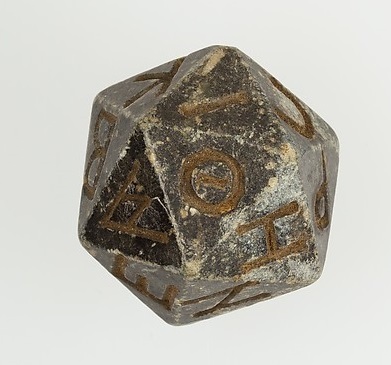 Dice games have been uncovered in Mesopotamian tombs (some as far back as the twenty-fourth century BC), and a Vedic Sanskrit text known as the Rigveda, which dates back to India in 1500 BC, also mentions dice. Tile games have a similarly deep history. Chinese Dominoes can be traced back to writings of the Song Dynasty, nearly a thousand years ago. Dominoes as we know them first appeared in Italy during the 1800s, and some historians theorize they were brought to Europe from China by traveling missionaries. Another tile game, Mahjong, has been around for centuries, but there are several different origin stories for the game, one tracing back to the Ming Dynasty (1368-1644), another to the days of Confucius (500 BC). Perhaps at some point, I’ll try to put together a historical timeline of gaming (similar to the crossword timeline I created around the 100th anniversary of the crossword). In the meantime, I’ll settle for being utterly fascinated with just how long humans have been socializing, relaxing, and competing through the medium of games.